Teaching kids to cook not only leads to healthier eating but also gives kids skills that could save them money as adults. “Usually I just eat cereal or cook some eggs for dinner.” my friend admitted me. “Huh?” I thought to myself. Here we were in our late 20s and all my friend knew how to cook were eggs. Nothing else, just eggs. As we kept talking it became obvious cooking was intimidating to my friend. She’d never been taught basic cooking techniques (other than teaching herself how to scramble eggs), her diet suffered for it (cereal for dinner? ), and she was spending far more than she needed to on food. That story stuck with me over the years as one of the reasons why I MUST teach my kids how to cook before they leave home. Cooking has always been enjoyable for me – I love to try new recipes and test new foods. After a long day, cooking can be a creative outlet and provide a satisfying feeling of accomplishment. Plus, it’s a great way to bring friends and family together. 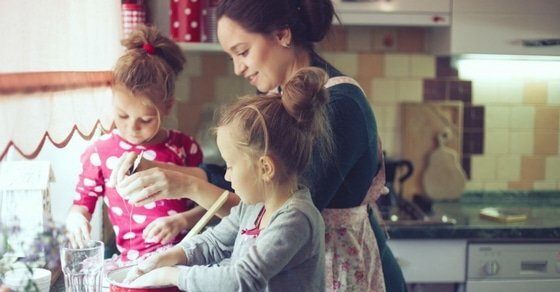 But even if you’re like me and love to cook, you might be wondering how exactly to pass on your knowledge to your kids. 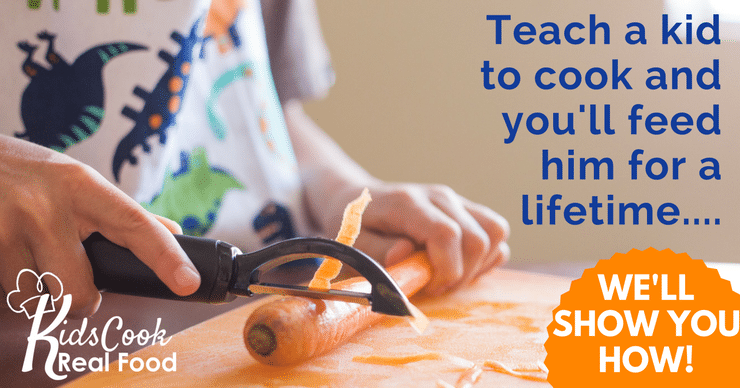 Here are a few suggestions on how to get kids comfortable in the kitchen and teach them the basic skills they need to grow into confident cooks. Kids as young as 18 months can begin to help (or more like “help”) parents in the kitchen. Even if a toddler isn’t ready to do actual measuring and mixing – let him take part in some sensory play with flour or even a salt shaker to introduce him to what happens in the kitchen. It’s also helpful to supply kids with the right tools – perfect for small hands and nothing too sharp – that will let them get more practice in the kitchen. Once kids are a little older – around 6-8 years old – they can begin to take on more responsibility, put together a few basic meals on their own, and start following simple recipes. One of the first meals my girls made was eggs in a basket – after cutting a circle from a piece of bread with a cookie cutter, they heated up butter in a frying pan, toasted the bread in the butter, and then cooked a cracked egg in the hole of the bread. It’s become a favorite breakfast for them and taught them a few basics such as how to crack an egg, and how to safely use a stove. 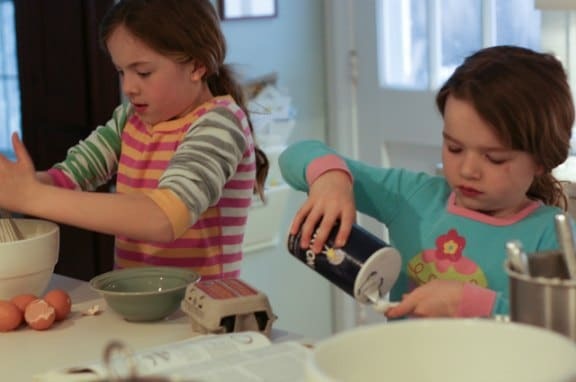 Warming kids up to being competent in the kitchen is a great start to raising kids who cook, but what they’ll eventually need are real cooking skills. If you’re like me and have been cooking for years, you probably take your cooking skills for granted – How to safely use a knife, the best way to measure, and how use the stove without getting burned. Knowing exactly what I need to teach my girls about cooking and the best way to explain it to them was not something I instinctively knew how to do. Sure I could have spent time researching what I needed to teach them, but I was grateful to discover a step-by-step online cooking course that does all the work for me. 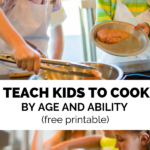 Kids Cook Real Food contains 8 self-paced courses separated by ages and ability. The beginners group is recommended for ages 2-6 or those kids who have no experience in the kitchen, intermediate courses teach kids sharp knives and stovetop safety, and the advanced level gets kids comfortable using small appliances and making more advanced dishes (like bechamel sauce). 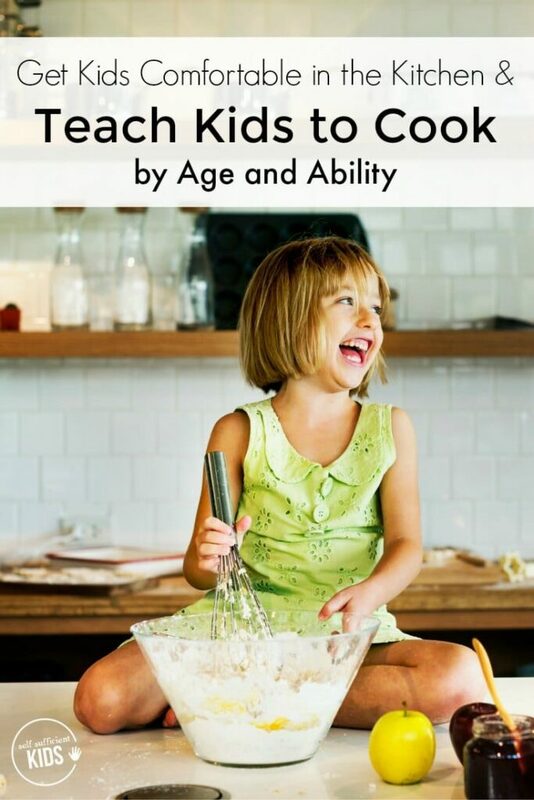 Because the course is self-paced, kids can skip around if they’ve already learned how to crack an egg, for example, or simply aren’t interested in cooking beans. I can’t say enough good things about this course. 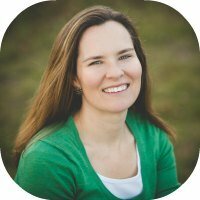 Katie Kimball, the creator of the course and a former teacher, presents information in a way that is fun and understandable for kids. She uses fun phrases such as “up and over soldier” to describe to kids how their fingers should look while slicing food. These sayings stick with the kids as a quick reminder of what they’ve been taught. 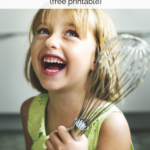 In addition to the classes, students also have access to 34 easy-to-make recipes used in the course, flashcards that provide a quick reminder of what kids learned in each class, and an activity packet. My girls have been learning to cook for a few months now and guess what? Last weekend, they made us dinner on their own! Using the skills they’ve learned in the Kids Cook Real Food course, my youngest made whole wheat tortillas from scratch while my oldest cooked a chickpea wrap filling. As they scurried around our kitchen preparing the meal, I sat off to the side and answered questions about where to find ingredients and how best to roll dough into a circle. About an hour later, the meal was finished and we all sat down to eat. The girls were filled with pride as we dug in and enjoyed our meal. And I breathed a sigh of relief knowing they’ll have at least one other option to cereal for dinner when they’re on their own.